This page (as the title says) is all about the life of a star. It will show all the stages that a small star, and a massive star have to go through during their lifetime. We have all sorts of pics and links for you to look at and explore when you are just about ready to recieve that vast information that we have kindly put together. But we have one FAQ! Stars are hot bodies of glowing gas that start their life in Nebulae. They vary in size, mass and temperature, diameters ranging from 450x smaller to over 1000x larger than that of the Sun. Masses range from a twentieth to over 50 solar masses and surface temperature can range from 3,000 degrees Celcius to over 50,000 degrees Celcius. The colour of a star is determined by its temperature, the hottest stars are blue and the coolest stars are red. The Sun has a surface temperature of 5,500 degrees Celcius, its colour appears yellow. The energy produced by the star is by nuclear fusion in the stars core. The brightness is measured in magnitude, the brighter the star the lower the magnitude goes down. There are two ways to measuring the brightness of a star, apparent magnitude is the brghtness seen from Earth, and absolute magnitude which is the brightness of a star seen from a standard distance of 10 parsecs (32.6 light years). Stars can be plotted on a graph using the Hertzsprung Russell Diagram (see picture below). 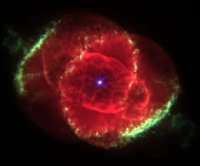 It shows that the temerature coincides with the luminosity, the hotter the star the higher the luminosity the star has. You can also tell the size of each star from the graph as the higher the radius the higher the temperature and luminosity. Small Stars- The Life of a Star of about one Solar Mass. Small stars have a mass upto one and a half times that of the Sun. Stage 1- Stars are born in a region of high density Nebula, and condenses into a huge globule of gas and dust and contracts under its own gravity. This image shows the Orion Nebula or M42 . Stage 2 - A region of condensing matter will begin to heat up and start to glow forming Protostars. If a protostar contains enough matter the central temperature reaches 15 million degrees centigrade. This image is the outflow (coloured red)and protostar. Stage 3 - At this temperature, nuclear reactions in which hydrogen fuses to form helium can start. Stage 4 - The star begins to release energy, stopping it from contracting even more and causes it to shine. It is now a Main Sequence Star. Stage 5 - A star of one solar mass remains in main sequence for about 10 billion years, until all of the hydrogen has fused to form helium. Stage 6 - The helium core now starts to contract further and reactions begin to occur in a shell around the core. Stage 7 - The core is hot enough for the helium to fuse to form carbon. The outer layers begin to expand, cool and shine less brightly. The expanding star is now called a Red Giant. Stage 8 - The helium core runs out, and the outer layers drift of away from the core as a gaseous shell, this gas that surrounds the core is called a Planetary Nebula. Stage 9 - The remaining core (thats 80% of the original star) is now in its final stages. The core becomes a White Dwarf the star eventually cools and dims. When it stops shining, the now dead star is called a Black Dwarf. Stage 1 - Massive stars evolve in a simlar way to a small stars until it reaces its main sequence stage (see small stars, stages 1-4). The stars shine steadily until the hydrogen has fused to form helium ( it takes billions of years in a small star, but only millions in a massive star). Stage 2 - The massive star then becomes a Red Supergiant and starts of with a helium core surrounded by a shell of cooling, expanding gas. The massive star is much bigger in its expanding stage. Stage 3 - In the next million years a series of nuclear reactions occur forming different elements in shells around the iron core. Stage 4 - The core collapses in less than a second, causing an explosion called a Supernova, in which a shock wave blows of the outer layers of the star. (The actual supernova shines brighter than the entire galaxy for a short time). Stage 5 - Sometimes the core survives the explosion. If the surviving core is between 1.5 - 3 solar masses it contracts to become a a tiny, very dense Neutron Star. If the core is much greater than 3 solar masses, the core contracts to become a Black Hole. If you want to find out more about Messier objects then there is good link to start you off. (Students from Chesterton High School, North Staffordshire, England, The Earth, The Solar System, Gould's Belt, The Milky Way Galaxy, The Universe, One Parallel Universe of many!!! ).